Variable heater control up to 1022°F (550°C). 110 VAC fused and fully grounded power supply with power lamp. 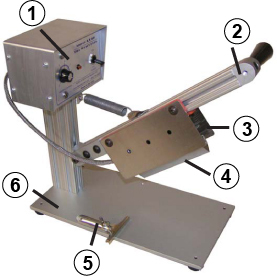 The ARX-80 HotCutter is a general purpose hot knife cutter used for hot cutting and sealing woven and knitted synthetic materials to prevent fraying. Cuts webbing, braid, elastics, strapping, cord, ribbon, hook and loop, and rope. To operate, simply slide the webbing across the base plate and bring the handle down to cut and seal with minimum effort. Cutting time is usually less than one second, depending upon material thickness and heat setting.